The HammockGear.com Netted Hammock is a modular mosquito hammock featuring a removable/stowable zippered bug net. Netted mesh peak bags at both ends of the hammock are large enough to store the bug net when unzipped and other small gear items. The spacious side storage pouch is sewn to the side of the hammock, similar to open style hammocks, but is large enough to hold the hammock, bug net, suspension, and other items. When in hammock mode, the stuff sack can be used to hold other items, although it is on the outside of the bug netting. Quilt hooks are sewn at the peaks, about 10-15 inches from the peak. There are four zipper pulls, so the netting can be accessed from either side of the hammock, depending on how you align the zippers. The hammock is symmetrical, so laying head right or left makes no difference to how the hammock works. The deep sag of the hammock, along with a diagonal lay, helps to press the bug netting away from your face without the need of side pull outs. When ordering, there are a few customizable options, primarily around the suspension options. 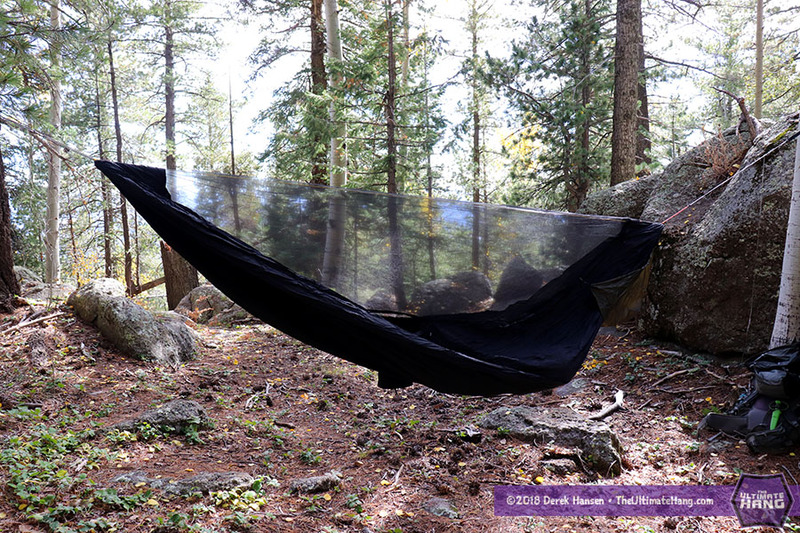 The hammock comes in black, 1.6 oz Hexon fabric and includes a ridgeline. This hammock has a deep sag, at least that was my first impression when I dropped in. The ridgeline was nearly out of reach and I felt swallowed. Was this really just an 11 ft hammock? It felt huge. And comfortable. Those who’ve slept in a hammock swear that longer hammocks are more comfortable, and the Hammock Gear Netted Hammock proves it. One thing I love about testing cottage vendor gear is that I can nearly always count on it reflecting the most up-to-date research and trends on what really works. My demo hammock came with Amsteel end loops, each a different color so I could set a preferred head and foot end when hanging, even though the hammock itself is lay-agnostic. Tree straps can be added when ordering (nice!) but are extra. Suspension and Anchor System ★★★☆☆ The hammock doesn’t come with suspension and end loops are extra. Construction and Craftsmanship ★★★★★ Cottage vendor quality = top quality. Modularity ★★★★☆ The nearly removable / stowable bug net is a nice feature that not all hammocks at this price range can boast. It means you can convert this hammock into “open” mode when bugs aren’t an issue or if you’re just lounging about. Aesthetics ★★★★☆ Not a lot of color options, but the quality fabric and matte black play well with other colors if you’re matching things up. Price and Value ★★★☆☆ This is meant to be an entry level jungle hammock for Hammock Gear and the price is right in the middle of other competitors for the same feature set. It’s a good value, but competition is fierce in this category. Hey Derek I have a general question re: camping hammocks. I backpack in areas that sometimes have no possible way to hang and would like a hammock that is purposely made to double as a single man bivy. I know that people do this with current hammocks made for hanging, but my issue with those is that they do not have a waterproof bathtub floor, which means that in a severe rainstorm water might intrude on one’s backside by creeping in over the footprint or ground cover. So I think I am looking for a hammock that is waterproof. I did find a place that sells a ground cover with a bathtub floor which might work but I am trying to avoid being real complicated and I have never seen anyone use one with a hammock and they are $$. Is a waterproof hammock made/doable/practical? Thank you Derek. The US military tried this back during the Vietnam war and it was a disaster. The waterproof bathtub floor not only did a good job of keeping water out, it kept water in: sweat, perspiration, and respiration. These early GI jungle hammocks were modified to be more breathable. As you describe, you still need a ground cloth otherwise you risk ripping holes in your hammock and that’s no good. A better compromise is DWR treatments. The Lawson Blue Ridge hammock has a bathtub type bottom and is designed to double as a pop up tent, complete with poles. Heavier but not impossible to backpack. If it were me and I really had to plan for a wet ground bivouac I would build me my own bathtub floor and ground cloth combo out of Tyvek and Tyvek tape. Fold up the edges and make a sort of origami floor. Then you can use any jungle hammock as your bivouac sack. That is an excellent idea, especially since i use Tyvek ground cloths already. Thank you. Derek, do you think that the HammockGear.com Netted Hammock would work well with my Jacks R better under quilt?